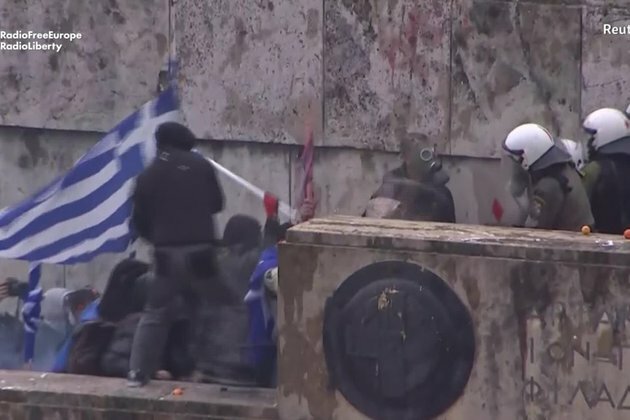 Protesters have clashed with police outside Greece's parliament during a protest rally that drew tens of thousands of people against a name deal with Macedonia. Dozens of demonstrators threw rocks, fireworks, and other objects at riot police officers as they tried to enter the parliamentary premises in Athens on January 20. Police responded with the use of batons and tear gas. Nine officers were injured in the violence, they said. The governments of Greek Prime Minister Alexis Tsipras and his Macedonian counterpart, Zoran Zaev, struck the deal in June to change the former Yugoslav republics name to the Republic of North Macedonia. In exchange, Athens would lift its objections to the country joining NATO and the European Union. Greek lawmakers were expected to start a debate on January 21 on ratifying the agreement and vote on it by the end of the week. Earlier this month, Macedonias parliament approved a constitutional revision to change the country's name. The deal has met with opposition in both Greece and Macedonia with critics saying it makes too many concessions to the other side. Athens argues that use of the term 'Macedonia' implies territorial claims on Greeces northern province of the same name, and on its ancient Greek heritage. 'There is only one Macedonia, the Greek Macedonia, 'that's it',' read a sign held by one protester in Athens. 'This government is a government of traitors,' Christina Gerodimoun, in her 30s, told the AFP news agency, in reference to a coalition led by Tsipras. The Greek prime minister survived a confidence vote in parliament on January 16. The motion was launched after his junior partner, Defense Minister Panos Kammenos, resigned in protest over the agreement.